I picked up BECAUSE OF AN ACORN at my local indie the other day. I was drawn to it by the cover art. A lone acorn on the ground on what appears to be a perfect fall day in all it’s gray glory. 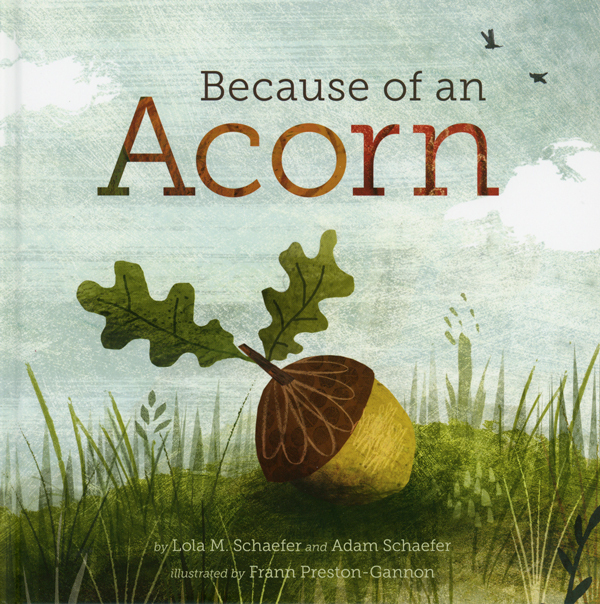 Written by Lola M. Schaefer and her son Adam Schaefer, and illustrated by Frann Preston-Gannon, this is a simplified look at ecological cycles and food chains and how everything in our world is connected to and/or affects the other things in our world. It is beautiful and quiet and poetic nonfiction. The text is sparse and graceful. It starts with a fallen acorn. Because of that acorn, a tree is sprouted. Because of that tree, there is a bird. Because of the bird… You get the idea. In describing cycles like these, there are many swerves and digressions and different paths to take to complete it. Some are more obvious than others. The Schaefers make some interesting choices to bring us full circle. They use examples that will evoke both questions and discussions through multiple readings. The illustrations are gorgeous. They were created with scanned, painted textures that were then manipulated digitally. It gives them a beautiful paint and collage look. (A technique that, as an illustrator, I am compelled to experiment with.) They have a limited but luscious palette of desaturated grays and greens and reds and browns. I’ve found myself leafing through the book and lingering over the pictures—not just compositionally (which are lovely) but marveling at the beauty of the textures and shapes Preston-Gannon created. The back of the book has more detailed information about the importance of all the players in the cycle. And there are tips of how we can help maintain the process. BECAUSE OF AN ACORN is a wholly satisfying little gem. A calming respite from a hectic day. ****Announcement! The winner of the “BABY LOVES” science books written by Ruth Spiro from the Oct. 25 PBB post is Cathy Ballou Mealey. 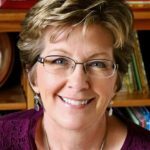 Cathy – please email Ruth Spiro through her website (ruthspiro.com) and give her your address and she’ll mail your two books! Beautiful!! Truly a work of art!! Thank you for sharing. I can’t wait to track down a copy. This looks like a perfect example of a highly-effective (and successful!) quiet book. Thanks for bringing it to our attention, Kevan. Yes! The term “quiet books” is too often used as pejorative. This is such a lovely, quiet book. I’m planning fall nature activities with my grandchildren and this looks like the perfect book to read when we get back home. Oh!! Going to check it out now! Thanks, E.! That surely is a gorgeous cover! Adding this to my reading list. Calming is good–along with the Cubs recent win–during this stressful election! Quiet books tend to be my favorite reads :). 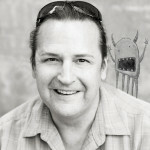 Thanks for the lovely post, Kevan. My copy just came in at the library, so I’ll be picking it up next week. Really looking forward to reading it! I’m really looking forward to getting my hands and eyes on this book! 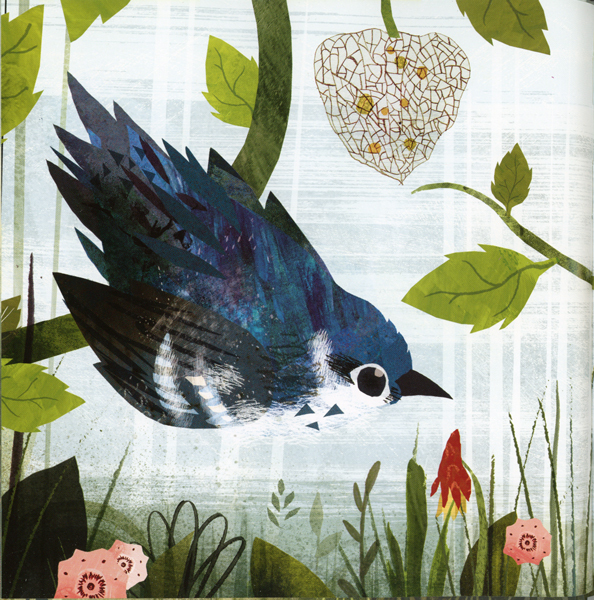 It is always a treat to find a poetic non-fiction picture book. Oh my – I must be living under a lucky star to win books again! Thank you! 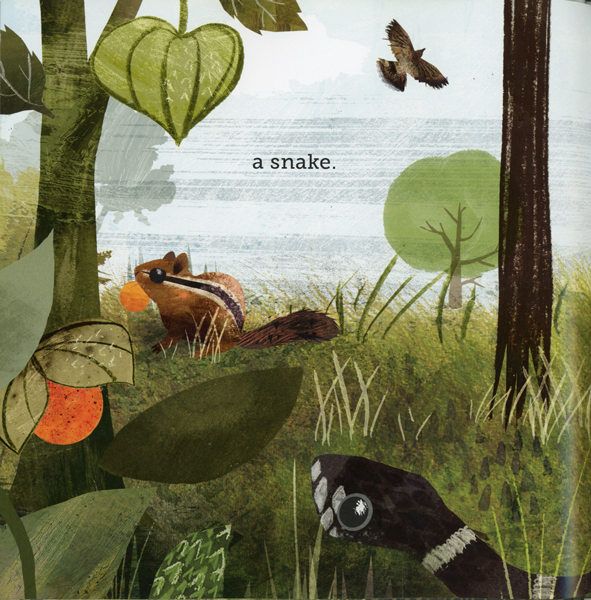 Putting ACORN on my TBR list right away – sounds delightful and the illos are gorgeous. Agree with all. It is a beautiful book! I just got this book from the library. I loved it. So simple and so lovely. This looks really beautiful, Kevan. Having stepped on many an acorn this fall, I’m eager to take a look. It looks like a beautiful book! I’m looking forward to reading this one! This looks like a wonderful book. Thanks. I’m very intrigued by both the art and the non-fiction aspect of the book. Looks like a book with both intriguing art and story. Definitely adding this to my to-read list. I read this last week, Kevan. I fell in love! We need a quiet book. The words and illustrations compliment each other perfectly.